The famed Notre Dame cathedral in central Paris suffered catastrophic damage from a fire that started Monday afternoon and continued to burn into the evening. Smoke and flames could be seen billowing out from the top of the 13th century medieval cathedral on TV live feeds and tweeted videos. 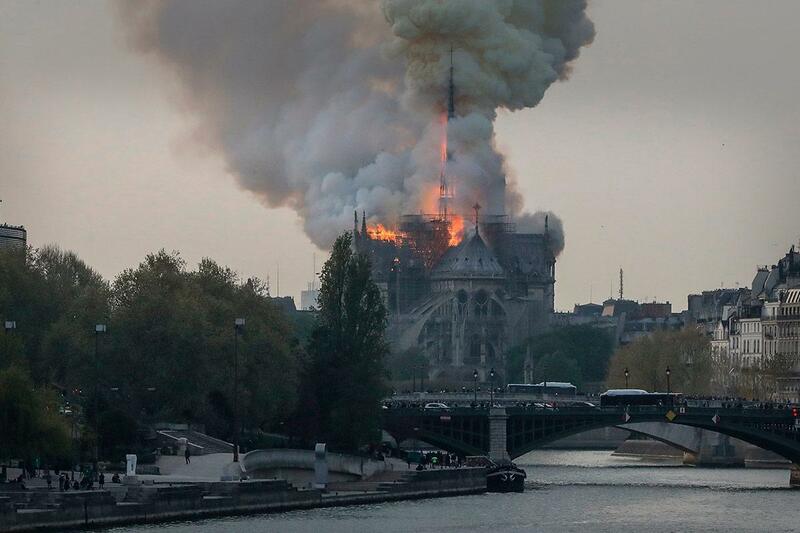 France 24 network reported that there had been no injuries from the fire and that the cathedral had been closed to visitors shortly before the blaze broke out. The iconic spire of the cathedral collapsed shortly after 2:30 pm ET. The Paris prosecutor's office has launched an investigation into the cause of the fire, according to France 24 reports. Fire officials have told local French media that the blaze appeared to have begun in an area were restoration work was being conducted on the roof. French President Emmauel Macron was on scene with the mayor of Paris, who confirmed the fire and called for people to remain away from the scene. "Notre Dame of Paris in flames. Emotion for a whole nation. Thoughts for all Catholics and for all French. Like all our countrymen, I'm sad tonight to see this part of us burn," Macron said. "A terrible fire is underway at Notre-Dame Cathedral in Paris. The @PompiersParis are trying to control the flames. We are mobilized on the spot in close connection with the @dioceseParis. I invite everyone to respect the security perimeter," Hidalgo said. The cathedral dates back to the 12th century and is famous for featuring in Victor Hugo's classic novel, "The Hunchback of Notre Dame." It is considered a feat of architecture as much as a religious symbol. It is one of Paris' most popular attractions, drawing an estimated 13 million visitors a year. The famous landmark was in the midst of undergoing renovations, with some sections under scaffolding. Some artifacts including bronze statues were removed last week for the renovation work. In a tweet, President Trump suggested using air tankers to put out the fire. French security forces promptly tweeted that using air-dropped water could cause the entire structure to collapse.